Imam Warithudeen Mohammed II along with a TMC/NJ delegation visited NJ July 7-11, 2018. First visit was with Imam Aqeel Mateen & some of the believers of Masjid Ash'Shifaa / United Muslim Inc. They toured property for a brand new Masjid being built from the ground up. 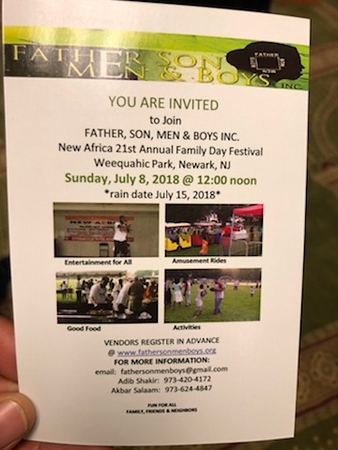 Other activities include attending the 21st annual Father, Son, Men & Boys Inc. New Africa Annual Family Day Festival, visiting the Bethany Development Community Outreach Senior Center, NIA Masjid & Community Center, Masjid Ali K Muslim, Masjid As Haabul Yasmeen, meeting with Mayor Ted R Green [East Orange, NJ] and Mayor Ras Baraka [Newark, NJ] - We are looking forward to the 29th Annual Muslim Convention Aug 31-Sep 2 in Newark, NJ G'd willing!